September | 2016 | amen and ehmen! Where There is HIS Will, There is Always A Way! I’ve been tossing and turning since about 5:00 a.m. and finally decided to get up and spend some time with You. No need in lying—I am fretting about work and all the things that need to be done. So many people expecting so much out of me. It’s hard knowing that people are getting upset waiting on things from me just so that they can get their own jobs done. There are only so many hours in a day and I have been working at full tilt. I’m really getting tired, both physically and emotionally. I feel my body getting run down. The worst part is that I see no end in sight. Looking at the schedule ahead, it just keeps going and going and going. But let me stop complaining and thank You, Lord. As I traverse this new valley in my life, You have also been a constant beside me. I would have never believed I could physically hold up to these relentless hours, particularly the 15-20 hour days that are coming at me weekly now. But, You have sustained me and for that I must thank You. Please continue to sustain me as long as it is necessary. I also want to thank You for my finances. While this recent change brought a substantial pay cut; though I have substantial medical bills as well as growing maintenance bills at my home, You continue to sustain me in this area as well. Though it is easy to get stressed about this, You have showed grace over and over again, somehow making it work. I must stay focused on that as that darn devil seems to derive pleasure from continuously launching curve balls right at my head! And thank You, Lord, for the people who are praying for me. I know there are several and I am humbled and honored that they are willing to take the time to approach You on my behalf. You know my heart, Lord. You know my desires. You know that, more than anything, I want to seek and fulfill your purposes and will for my life. Please help me to have a healthy fear of You, my Lord, but not a fear of what You have laid out for me. Help me Lord in all the areas that I need help, which are many. And help me to see You at every turn and in every corner; fill all the dark places with Your glorious light. I love You, Father. With all that I am, Amen and Ehmen. Oh, how easily distracted you are! It is okay, however, as I am just happy that you continue to find your way back to Me; that, here in this moment, you are taking the time to just sit with Me, just like my daughter, Mary. You recognize the many blessings I pour on you in return when you, too, slow down and take pause, basking in My presence. Stress is a sure sign that you have chosen the busy, busy path of Martha. My child, people will always try to pile work upon you as long as you live in the world. They will stack it so high that you will feel like once more single request, no matter how small, will cause it all to come crashing down like a house built on sand. But, that won’t happen as long as you lean on Me. Continue to look to Me. When your day seems out of control; when the tasks are too many and the hours too few, call out to Me. Just whisper My name. Nothing is too hard or too unimportant to Me, because you and the purpose I have designed you for are of utmost importance. I will never let you get too bombarded that you cannot fulfill your purpose. Where there is My Will, there is always a way. Don’t forget that! Wear this word like a bumper sticker on your heart. You need not worry about anything. I have it all under My control. Just keep listening to my voice and following my lead. I love you, Child, and I am proud of you. Take on this day with that knowledge and breathe easy knowing in your heart that we will do it together. I realize that most writers are also avid readers, but truth be told, outside of the bible and a blog here and there, I really do not read much. And, when I do read, it usually tends to be books to which I feel particularly drawn or to which God seems to lay in front of me over and over until I pay attention. A few years ago, it was Seven Days in Utopia. One day as I was researching something online for work, I opened a random webpage. Though I had not clicked anything and my cursor blinked rhythmically within the safe confines of the search bar, my screen was instantaneously filled with not one, but multiple video advertisements. Cascading from top to bottom, video clips bombarded my consciousness–each one playing a different part of the trailer for the book’s newly-made movie. At first I was annoyed, but after the fifth or so video popped up, I was compelled to pay attention. Determined to figure out if this had been a stroke of marketing genius or a simple computer malfunction, I noted the name of the movie and closed and reopened the page to see what would happen. This time the page remained static with just one banner ad across the top. I moved my cursor from the search bar onto the ad and clicked. The movie trailer began playing again, but this time just once. I then went to another computer at my house and navigated to the same page. Again, I had to move my cursor and click on the banner ad for it open a single time. I even had my daughter check from her MacBook and, no big surprise, one banner ad and one click to open. May God–the author of our lives–continue to nudge me and keep me on the path to putting this story and others on paper. And I ask that you, too, the reader of this, pray for me as all too often I let satan and life dampen my passion for the purpose He has lay before me. I will pray the same for you–that passion for your own purpose is reignited each and every day. Amen and Ehmen! I needed this again this morning. I love the way God brings me just the Word I need when I need it most. Have a great day, all, for you and I are already blessed beyond measure. 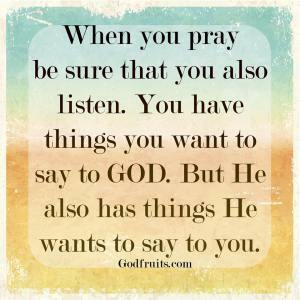 Writer’s Note: When you pray, make sure to listen, too. God has many wonderful things to say. Thanks to Facebook “Memories,” I ran across this early morning conversation I had with Him back on September 18, 2011. It was a tough period when two of my dearest friends had just been diagnosed with life-threatening diseases. And, while there was much sadness and grief surrounding the circumstances on that day and days to come, I have to admit that it drew me closer to our Lord and Savior and I learned to really listen. And for that I am eternally thankful. God, I love you so very much. Thank you for always being there for me! Amen and Ehmen! Me: But, God, why are testimonies so important? Why can’t we just write fiction? Why do people have to actually live these trials and tribulations; these nightmares? It’s not just a promise. It’s an oath. Preface: What beautiful words and the most fitting and perfectly-timed message. I still can’t believe that God, without fail, shows up when I sincerely seek His face in the early morning hours, keyboard at hand. Though I had no idea where he might lead me, this morning He sent me to Hebrews, Chapter 6. The name of the Book and the Chapter just floated to the forefront of my conscience as I finished typing my prayer to the Father. I read the scriptures, wide-eyed and intently, soaking it in, and typed those verses that I felt particularly led to. How many times will He have to remind me that what He has promised is already mine? I hope I don’t need reminding so much in the future, but I am oh so thankful that He has been so patient with me. I just have to wait like Abraham. Hanging on to this precious message and Word from God. Thank you, Jesus. Praising you, with all that I am! Amen and Ehmen! As you know, I have been awake for a couple of hours already, since around 4 a.m. I have much rattling around in my head regarding work and I find myself fighting internally over worrying about that and wanting and needing to spend time with you. I feel that you have something to do with me waking up so early and not being able to go back to sleep. And so, after praying profusely in the dark and then being distracted by various media, I am finally here. Here, in front of the blank page as you so often beckon me. There is a certain comfort in staring at the blank page as I know that this is where You often meet me. The rhythmic blinking of the cursor mesmerizes me and the cadence is strangely familiar, like the beating of a heart. I like to think of it as Your Heart, dear Lord. Show me Your Heart, Lord. Give me direction and instruction and accept my praises. I love you. I need you. Come close for I am finally here. Turn to Hebrew 6, my Child. (15) THEN Abraham WAITED PATIENTLY, and he RECEIVED what God had Promised. Now when people take an oath, they call on someone greater than themselves to hold them to it. And without any question that oath is binding. God also bound himself with an oath, so that those who received the promise (Brenda!) could be perfectly sure that he would never change his mind. It’s hard to believe it has been a year since my brother left us. Although I am thankful to know he is now seated in Heavenly Places and I am happy for the memories, it still hurts not having him around. Memories don’t breathe, laugh, smile and talk. Miss you like crazy, my brother. One year ago today, I heard your voice for the last time. I miss you, dear brother. Truth is, I have missed you every day since you left us, but as we move closer and closer to the one year anniversary of your death, it has been especially hard. While the grief process continues and I have taken many strolls down memory lane remembering your life, these last few days have found me especially reflective of your death. Those were dark days, brother. Painful days. It was so hard to watch mama as she realized she had to let you go. No mother should ever have to bury her child. It was hard to watch the interaction between you and Karen. It was obvious that she was the love of your life. As dim as your eyes became, the soul-depth love you had for her burst forth like a beacon in the darkest of nights. It was heartbreaking and heartwarming all at the same time. It was hard for all of us who loved you to say goodbye, but we didn’t have a choice. All of our days on this earth are numbered and, ready or not, one day the last day will come for all that have ever drawn breath. Still, I can promise you none of us were ready for it to be your time. At the time, the worst part of it all, Gary, was not really knowing your spiritual condition; not being sure that you had accepted Jesus as your Lord and Savior. Not being sure that you would soon enjoy everlasting life with our Father in Heaven. I know that it was said many times right before and after your passing that a man’s faith is a personal matter and that one doesn’t have to talk about it, but that just isn’t true. No words will ever be able to express the extreme heartache not knowing levies on the hearts of those who struggle with the thought of never seeing their loved one again. It is the same wrenching heartache that I felt a few years prior when I, as an adult, began to deal with the tragic death of our daddy decades before. In talking to mom one day, I discovered that at the time of dad’s death, she wasn’t certain of his salvation. Like you, he was a man with a heart of gold and a man of great respect and humble attitude, but, unfortunately, they had never talked about it. Having been only eight when dad was taken from us, I never really got to know him. I can only hope for another chance on the other side. Now, Gary, that’s not a phrase that I had ever heard and I knew instantly that it was the still small voice of our ever-loving God. Powerful words swaddled in that unsurpassed comfort and peace that can only come from Him. I just knew and it’s all I needed. I was so excited and relieved that when got to your memorial service, the first person I hunted down was Patty; and when we hugged, I excitedly whispered the good news. She, too, began to grin from ear to ear. Sigh. What a beautiful gift. I can’t tell you how much easier it made it to say goodbye. You know it rained during your service that day and I can just remember thinking that it was apropos. In fact, I think it was Heaven’s way of helping us mourn our loss while celebrating its gain. Though I have spent the last several years hoping and feeling like he is probably with you in our eternal home in Heaven, I have never received such certain reassurance as I did with you. Until this week. Enter another cousin. This one, Debbie, one of Uncle Don’s daughters. She had read a recent post about how hard it was to hear that daddy’s salvation was also unknown to those who loved him most. It spurred a memory that she shared, probably a nudge from God, if I had to guess. As you know, Uncle Don also left this earth way too early. He died in a car accident when he was in his early 30s, leaving behind a beautiful bride and two beautiful young daughters. Daddy always made sure to stay connected to them and our families were quite close, I am told. What I didn’t know was that Aunt Vera Lee, Uncle Don’s widow, had spent some time in the hospital visiting daddy during his last days. Debbie relayed a sweet story that her mom had shared before she passed about how they sang a hymn together and that daddy had been the one to start the singing. She also relayed how she had felt the presence of Uncle Don in the room with them, so heavy, in fact, that she said she actually spoke his name out loud. Sigh. Another beautiful gift. We will see you both again! And Uncle Don, who I never knew. And Grandma. And Granddaddy. And our beautiful aunts, Aunt Hazel and Aunt Vera Lee. You are all there waiting for the rest of us and celebrating every moment with our Awesome and Beautiful Creator. I can only imagine, but boy oh boy do I enjoy imagining that day! But, until then, I still miss you. And, yes, there are still tears, but they are no longer all sorrowful. They are also intermingled with tears of joy knowing you are enjoying everlasting life and that one day we will meet again. Until then, to you and all of our loved ones previously departed, much love from earth to heaven.